An estimated 1.3 million people die from tuberculosis (TB) each year, and new drugs are desperately needed, especially as resistance to existing drugs increases. In a world first, a team of Maurice Wilkins Centre researchers has determined the structure of an enzyme that is an important target for development of new antibiotics to fight TB. That’s how Dr Jodie Johnston describes the moment she and a team of fellow Maurice Wilkins Centre investigators managed to capture and visualise the changing structures of the enzyme as it does its job. The enzyme, called MenD, plays a critical role in the production pathway of vitamin K, also known as menaquinone. Vitamin K is essential to the survival of the Mycobacterium tuberculosis bacterium responsible for TB. “MenD sits at the start of a pathway of enzymes that help make Vitamin K, and is therefore an important drug target for treating TB,” explains Jodie. The MenD enzyme makes several intermediate molecules on its way to producing Vitamin K, Jodie continues. 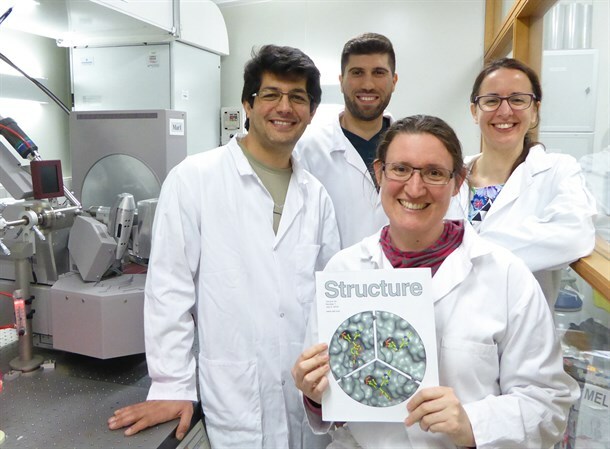 Together with her colleagues Dr Ghader Bashiri, Dr Esther Bulloch, Ehab Jirgis and Distinguished Professor Ted Baker, she used X-ray crystallography to “see” the 3-D structure of the MenD enzyme as it was bound to key intermediates. The team’s work appeared in the Structure journal, along with a coveted cover image. Understanding the structure of MenD now opens up new possibilities in developing drugs that could kill the Mycobacterium tuberculosis bacterium even when it’s not growing. L-r: Dr Ghader Bashiri, Mr Ehab Jirgis, Dr Jodie Johnston and Ms Laura Nigon. Finding new TB treatments is the focus of one of the Maurice Wilkins Centre’s Flagship Research Programmes, so a large team of researchers around the country is now poring over these results. The research also led to a prestigious 2016 Marsden Fund grant for Jodie, Ghader, Esther and fellow Maurice Wilkins Centre investigator Dr Wanting Jiao, all of whom are at early stages in their research careers. During their investigation of MenD’s structure, the team discovered that the enzyme only has two of its four active sites working at any one time. They also found that the enzyme had a regulatory site distant from the active site and captured a regulatory molecule bound in a molecular structure. The discovery has led the team to hypothesise that the control of the enzyme and its active sites assists the TB bacterium in “hiding out” in a latent state evading the body’s immune defences. The team is now using the Marsden grant to understand how the enzyme is able to turn its active sites on and off. Their research may also provide insight into a fundamental process known as protein cooperativity where molecules bind to a protein and alter the protein’s activity at other binding sites – potentially allowing organisms to adapt to environmental changes.